ControlEng: SERVOsoft News: SERVOsoft® v4 Coming Soon! SERVOsoft® v4 is in final stages of beta testing, and is planned to be released in late June 2017. Working closely with Michael Koch GmbH, we developed a detailed model to size KOCH Dynamic Energy Storage Modules, including DES, DEV and DEK modules, as well as DSM 4.0 and super capacitors. SERVOsoft models both the standard cycle and Backup Energy Supply on Power Loss. Users can drill down to investigate the energy storage, power flow, current and voltage levels at any stage of the system. "What if power failure" scenarios can be done with a simple right-click of the mouse at any point in the cycle. The detailed model is computed in real-time. 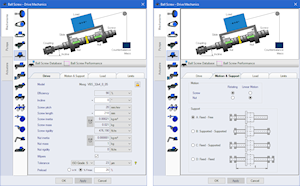 Working closely with Moog Industrial Group, we have developed the Ball Screw database feature with extensive and detailed sizing rules for Moog ball screws. Sizing rules include configurable custom screw lengths, column strength, critical speed, screw lifetime, 4 support types, ISO Grade tolerances, preload and associated torque, choice of wipers, etc. 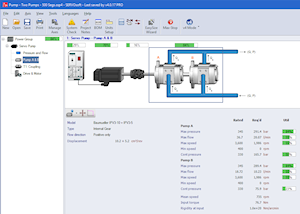 The Servo Pump now adds support for "Two Pumps" driven by one motor, where the user can specify if Pump A, or B, or both A & B are active for each sequence segment. And now in v4, the Servo Pump now comes standard with the Pro version. Previously in v3, the Servo Pump feature could only be ordered as an option. v4 also adds the Cart mechanism with an extensive range of variables to model a crane, electric car, etc. 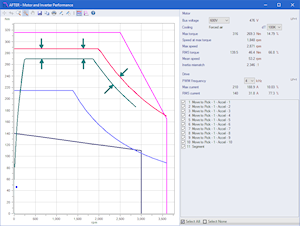 v4 also adds power groups, quick import sequence, and the option to display the motor vectors such as the Iq and Id profiles in the Sequence chart. ACT licenses can be re-used on the same machine. So if a drive needs to be reformatted, or a user needs to go back to a Windows Restore point, in most cases, the user can then re-install the ACT license file. This applies to all ACT licenses, including manufacturer version licenses, so long as it is the same machine and user. There are several performance improvements in v4 compared to v3.3 including up to 3.5x faster calculation performance, 1.6x faster thrust and payload formula calculations. Project files open 20% faster, and some large project files open as much as 5x faster. Finally, project files use a compression algorithm resulting in 2-8x smaller file size, making it that much quicker and easier to email large project files. For a detailed comparison between v3 and v4, click here. If you are a vendor and want to add your products to the SERVOsoft® database and/or are interested in the Promotion Version, please contact us.